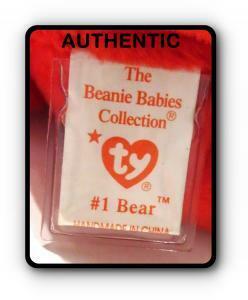 The Ty Beanie Baby #1 Bear is one of top Rarest Beanies on the market. 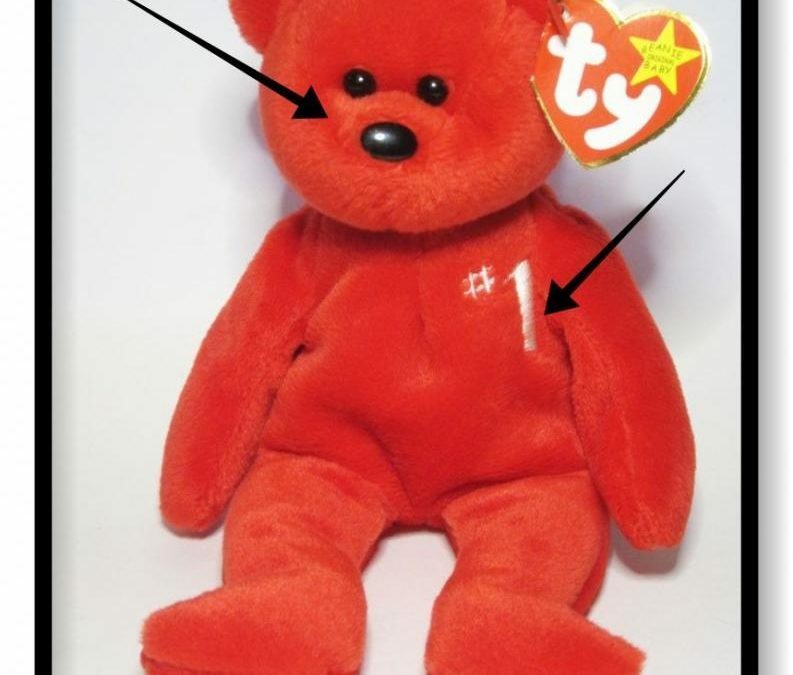 These bears were given to the Ty Sales Rep at the Ty Sales Conference in December of 1998. 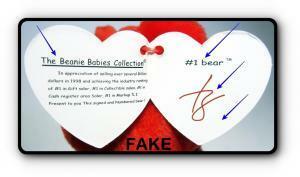 Below are pictures comparing the Authentic Ty #1 Bear Beanie Baby to a counterfeit #1 Bear, as well as the hang and tush tags. FAKE #1 Bear’s face is very scrunchy. The embroidered #1 emblem is way over to the right, almost next to the arm’s seam. AUTHENTIC #1 Bear’s face is NOT scrunchy. The embroidered #1 emblem is higher up on the chest and shifted to the left of the arm’s seam. Below is a close up view of the embroidered #1 emblems. The FAKE embroidered #1 is lower on the chest and right next to the arm seam. The head is also very scrunched to the body. The AUTHENTIC embroidered #1 is up higher on the chest and farther away from the arm seam. The head is NOT scrunched to the body. 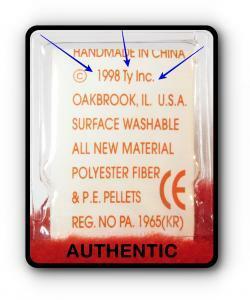 The information on the inside of the FAKE tag is INCORRECT – wrong punctuation, capitalization, thickness of Ty’s signature, and the tag is NOT numbered. The AUTHENTIC tag has the correct capitalization, Ty’s signature is done in a thin red ink, and the tag is numbered “___ of 253”. 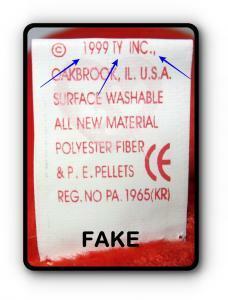 FAKE tag – font and punctuation is INCORRECT. The word “bear” is not capitalized properly. Ty’s signature is done in a thick dark red ink and the tag is NOT numbered. 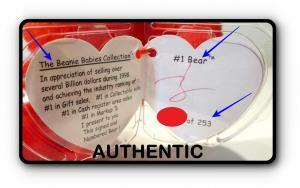 AUTHENTIC tag – word “Bear” is capitalized. Ty’s signature is done in a thin red ink and the tag is numbered “___ of 253”. 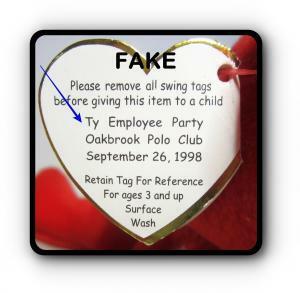 The information on the back of the FAKE tag is INCORRECT – it states “Ty Employee Party Oakbrook Polo Club September 26, 1998”. 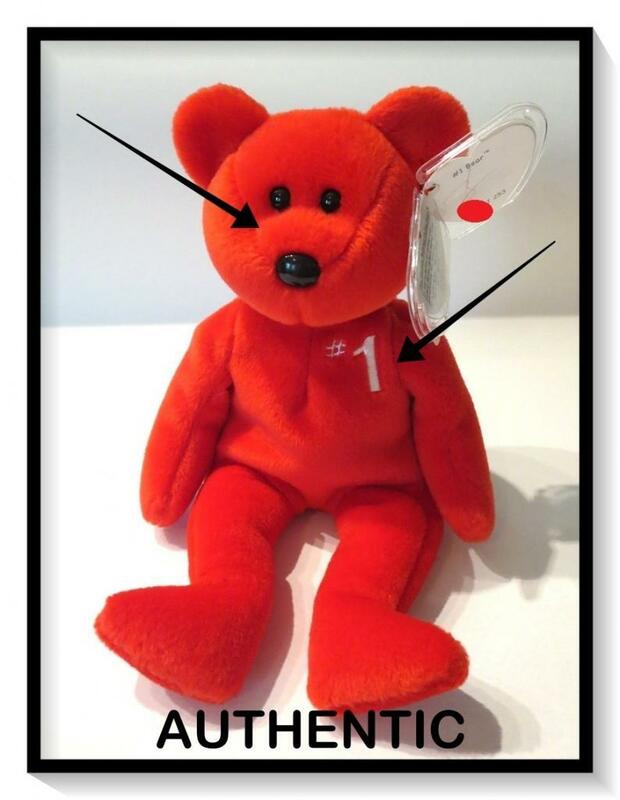 The AUTHENTIC #1 Bear was given to the Sales Rep at the “Ty sales conference Fairmont Hotel December 11 – 14, 1998”. FAKE tag states an INCORRECT event & date. AUTHENTIC tag states the CORRECT event & date. 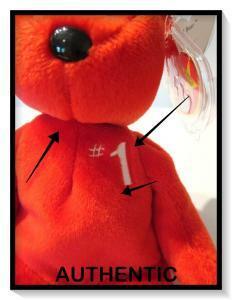 The #1 Bear ONLY came with a 6th generation tush tag. 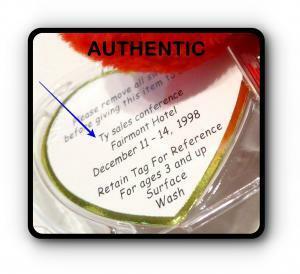 The information on the FAKE tush tag is INCORRECT – wrong tush tag generation (7th), color, and print alignment. This “hologram” representation of a 7th generation tush tag is very poorly done. The AUTHENTIC 6th generation tush tag is the correct tush tag for the #1 Bear. FAKE tush tag is the INCORRECT generation. The #1 Bear NEVER came with this type of tush tag. The hologram is FAKE – this is NOT even a real Ty tush hologram. AUTHENTIC #1 Bear ONLY came with a 6th generation tush tag. 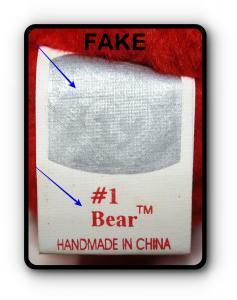 The back of the FAKE #1 Bear’s tush tag – INCORRECT copyright date, color, capitalization, punctuation and print alignment. The AUTHENTIC 6th generation tush tag ONLY came with a 1998 copyright date. 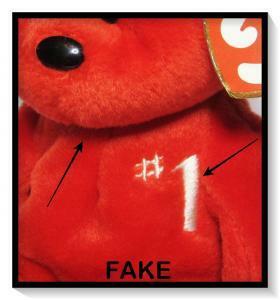 FAKE #1 Bear’s tush tag has the INCORRECT copyright date. The color, capitalization, punctuation and print alignment is also wrong. 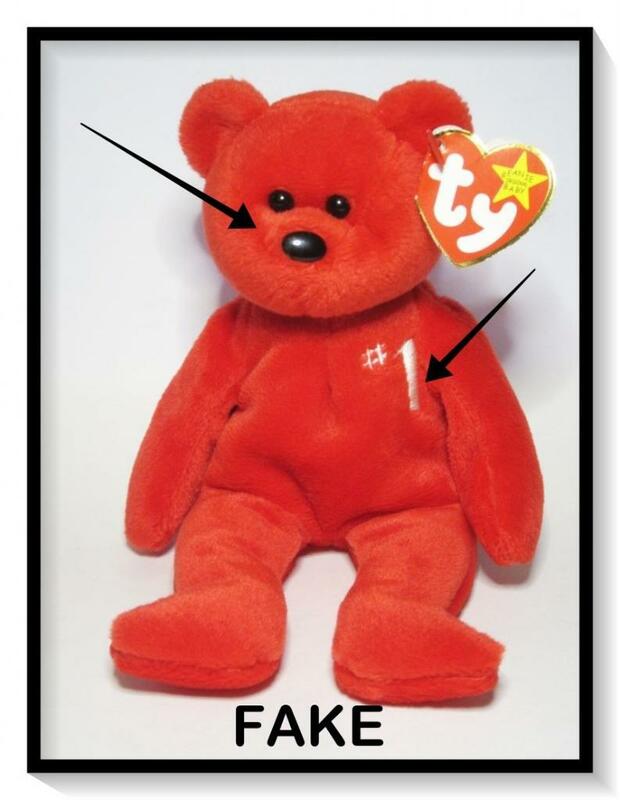 AUTHENTIC #1 Bear ONLY came with a 1998 copyright date on its tush tag.